Grace Notes are Maggie Boyle, Lynda Hardcastle and Helen Hockenhull. 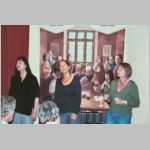 They perform a cappella and accompanied arrangements of traditional and contemporary songs in three-part harmony. Now in their 16th year, their highly praised and thoughtful repertoire make them one of the folk scene's best loved female groups. You will have plenty of opportunity to join in.